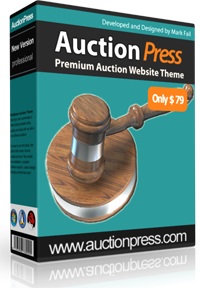 Create SEO friendly auction websites in minutes with our powerful auction theme for Wordpress. AuctionPress is a turn-key ready "out of the box" auction website solution ideal for creating niche market auction or paid listing websites. You simply install, select your template, setup your pricing then your ready to start accepting visitor submissions. Every purchase include lifetime FREE support and upgrades! Key auction script benefits at a glance..
No Encryption! 100% open source code. Customizable auction fields + custom pricing. AuctionPress includes both public and private auction types allowing your members to choose if they want their listing to appear in search engines. AuctionPress comes with a fully featured range of administration tools all designed to be user friendly and enable you to easily manage your auction website. AuctionPress allows you to customize the submission form with your own questions allowing you to tailor the input fields to your own niche market auction website. AuctionPress has built in slots for Google Analytics, Google Maps and Google Webmaster tools allowing you to easily track your visitors and create auction listings with maps. AuctionPress allows members to set their own 'buy now price' which gives visitors the ability to buy it out right or set a reserve price so that their items do not sell to low. The admin area of AuctionPress allows you to choose to use a 2 column or 3 column layout for your website giving you more or less room for extra Wordpress widgets and advertising. AuctionPress allows the admin to make some items featured which means they will display with a different background within search results to bring more click through's and visitor attention. AuctionPress makes managing finances easier by adopting a credit based system. Members by credits in bulk, 20,40,60,80 etc and then use those credits to list their items for auction on your website. AuctionPress has four built in advertising spaces, header,footer,left and right as well as a per category advertising system all of which can be customized in the admin area. Works with Google Adsense too! AuctionPress allows you to create your own search fields in the admin giving you the ability to create custom form fields then setup custom search options giving your auction website a more personal touch. AuctionPress comes with a built in private messaging tool which means members can contact each other through your website to enquire about auction items without disclosing their personal data. AuctionPress comes with its own built in image manager allowing the admin to edit images for better website presentation, it supports cropping, rotating and resizing. AuctionPress has a built in home page slider allowing the admin to create customize slides which will display text and advertisements on the home page. AuctionPress makes it easy to start accepting orders online, you simply enter your selected payment provider details into the admin area such as your paypal email and AuctionPress will setup and configure everything else for you. A callback page is also included making the payment process on selected gateways automatic allowing instant approvals and account updates. AuctionPress Theme comes ready "out of the box" which means all you have to do is select/customize your template, add categories and your ready to start accepting new auction listings on your auction website. There are no programming skills required, once installed you can manage your entire auction website via the easy-to-use web based admin area anywhere in the world 24 hours a day, 7 days a week! AuctionPress is search engine friendly allowing pages to be indexed by all major search engines and includes plugin support for custom page and category META tags. AuctionPress allows you to access and manage your store anywhere in the world, simply login via the password-protected administrative area and update/add products in real time. AuctionPress is a secure online system that supports hundreds of extra security Plugin's for Wordpress as well as HTTPS/SSL secure page. AuctionPress runs on the powerful Wordpress CMS with built in support for 1,000's of extra Wordpress plugins and widgets allowing you to easily extend the functionality of your website. For a limited time only! Get your copy of our auction theme for Wordpress for only $79! Normally $199. Our real estate software is a turn-key ready "out of the box" real estate website solution for both individual realtors and real estate companies. DirectoryPress turns a Wordpress blog into a powerful online directory website with lots of features, import tools and built in payment gateways. CouponPress turns any Wordpress blog into a professional coupon code or voucher code website with lots of coupon site features, in minutes! ClassifiedsTheme is a powerful, secure, SEO friendly classifieds theme for Wordpress with lots of professional features and extra classified website designs.